Silicone baby dolls are commonly identified as reborn dolls. As much as the best silicone dolls have gained popularity over the years, there are still a few people who don’t know much about them. A reborn doll is a doll that has been stripped of its factory paint, hair and eyes by an artist. The artist then works on it and repaints it to look like a real baby. That is where the term reborn comes in. The doll is basically given a new life in the end. However, nowadays most artists are able to use bare vinyl and silicone kits to spend lesser time in the process. A talented sculptor is capable of creating, ones with closed eyes, others with open and different facial expressions as well. The fact that they are so realistic increases their demand. People buy the best silicone baby dolls for different reasons. Some buy them for their children, others buy them for themselves. Some people have a hobby of collecting the dolls and basically buy them for aesthetics. The dolls have also become therapeutic for those who are grieving their children. They have also been known to comfort women who can’t bear children. These are just but a few reasons out of the many. PENSON & CO. Reborn Newborn Baby Realike Doll Handmade Lifelike Silicone Vinyl Weighted Alive Doll for Toddler Gifts 10"
The Ashton - Drake Galleries Tasha Edenholm So Truly Real Lifelike Poseable Baby Girl Doll: Little Peanut - 17"
The paint used on the silicone baby doll: this is important because some paints tend to rub off or even fade as time goes. Good paint such as the genesis heat set paint can withstand handling and is long lasting. The number of layers of paint used is also important. The more the layers the more life like the doll will look. The weighting materials used: to make it weigh and feel like a real baby, materials are placed inside the doll. However, it can only have a realistic feel to it, depending on what was used. Silicone dolls with glass dust in fingers and toes and bodies with tiny glass beads, provide a more realistic feel. Polly pellets are a great option for giving the doll’s body a soft feel. The doll’s hair and lashes: this is part of what makes the dolls have that realistic look. Quality mohair is one of the best materials to use for this. How the hair is held in place, will also help determine if they fall off or not. The most unique thing about this silicone baby doll is its skin. The entire process consisted many hours of multi-layering. The baby doll is made entirely from craftwork and hand paint. Soft silicone Vinyl materials were used to make ¾ of its arms and legs, but the whole head is made from them. PP cotton was used to fill the silicone doll’s shoulders and body. The doll’s limbs are movable and its entire body feels good to touch. It does not really have a specific gender. So you can buy it whether you wanted a baby girl or boy. For the hair, hand-rooted mohair was used. It can easily be shaped and fixed like that of a real baby. Some people even choose to give theirs a haircut. You will get a wig comb to fix it, in case it gets messy. The doll’s eyes are made of acrylic. It can be used by anyone aged 3 and above. You can choose whether you want your silicon baby doll to have blue or brown eyes. Nkol never fails to amaze. This particular doll is male and comes with a bottle, a magnet pacifier, Birth certificate and it will be wearing some clothes. The silicon doll can be bathed, made to sit and lie down. It has also been certified as safe to use, according to the En71 EU standards. It has hand-made rooted mohair. Real Touch® vinyl makes this doll look like it practically came to life. It is simply astonishing! Every detail about this silicone baby doll is jaw-dropping. From the furrowed brow, supple fingers to her tiny wrinkled feet, you will simply fall in love. I would recommend this for collectors, who seek out fine reborn collectibles. The doll is 18 inches in height. It was made by an award-winning artist. Master Doll Artist Linda Murray, presents her first ever African-American realistic interactive baby doll. The silicone baby doll is named Alicia and even has some wispy baby hair. I find this doll unique because it even responds to one’s touch. Her baby fingers curl around your finger when you gently press her hand! It is rare to see something so endearing and realistic with reborn dolls. The doll is a fine collectible. The baby doll is 22 inches. This is a genuine Andrea Arcello doll. It has been said to be the first Truly Real collectible vinyl doll, which “breathes”. The silicone baby doll has been designed with Real Touch™ vinyl skin and can lie in your arms like a real baby. When you lay your hand on Ashley, you will feel as if she is breathing. The body has been loosely jointed, to make her more realistic. It has hand-painted fingernails and toenails. The hair is hand rooted. Master Artist Linda Murray presents you yet another first. 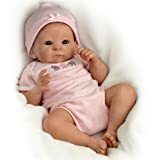 The Sophia baby girl silicon doll coos breathe and has a heartbeat. The cloth body is cuddly, and the skin is so soft to the touch. She is so soft to the touch and is even fully pose-able. This is definitely another must have for a dedicated collector. The doll is exclusively at the galleries. Sophia is a 19-inch doll. 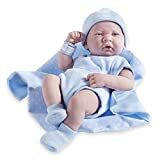 Surprise your kids or grandkids with this beautiful silicon baby doll. The doll has met the ASTM F963, safety requirements. This means that it is suitable for any 2-4 year old, who wants to play with it. The materials used are high quality and is gentle to touch. The doll can also be used as a Grandpa or Grandma Accompany doll or a Lovers and collectors collection. The head and limbs are made of vinyl. The doll is 10inch in size. This particular silicon baby doll is by Master Doll Artist, Tasha Edenholm. The artist named this doll after her inspiring and adorable peanut nose. When you look at the doll, you feel as if it has a sweet personality. This is also thanks to the details, which were sculpted meticulously. From her head to her toe, you can see it’s superbly handcrafted. It is a fine collectible. The doll comes with matching clothing. JC Toys Berenguer Boutique offers you a silicone baby doll, which you can handle as you would a real baby. The doll is water-friendly, and the kids can even wash and swim with it. your entire purchase will include; a short-sleeve baby shirt, diaper cover, pair of booties, hat, cloth diaper, a Soft Blanket, Belly Button Gauze, hospital bracelet, and Birth Certificate. It has a gentle smiling face. The doll will last for years. Paradise Galleries has topped our list today with its silicon baby doll. The doll comes with a lot of extra items. They include; a jersey knit pastel pink floral print onesie, jacket, hat, bib, blanket, bottle, pacifier, a pair of booties and the cutest giraffe plush friend! This 19-inch baby has brown hair and brown eyes as well. The lashes were hand applied. 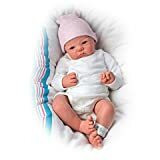 The Paradise Galleries Lifelike Realistic Baby Doll is our ideal option. At the beginning of the article, we mentioned that people have different reasons for buying the best silicone baby dolls. Created by the renowned artist Michelle Fagan, this silicon doll can cater to different individual’s needs. 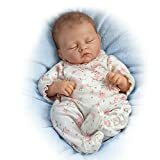 It ranks as the best of the top 10 best silicone baby dolls in 2019.